Happy Hour at the Tower is a free open climb event we hold twice a year in the fall and spring. This big event allows individuals (including Truman the Tiger) to check us out before bringing down a group. Learn more at ventureout.missouri.edu/happyhour. CliftonStrengths helps you to discover and identify your top talent themes in a variety of settings. By becoming aware of these talents, you can develop them into strengths. Strengths can be utilized for success in all aspects of your life, including career planning and in the classroom. The assessment is all about focusing on your natural talents to maximize your potential. Groups can purchase CliftonStrengths access codes from Venture Out for $15 per code (the MU discount rate). Participants will take the CliftonStrengths assessment before coming to Venture Out. Venture Out facilitators will incorporate language from CliftonStrengths into your Venture Out course debriefs. We can also offer a one-hour CliftonStrengths presentation to help your participants better understand their top five talent themes. This presentation can be done alone or in conjunction with a Venture Out course. True Colors is a short communication styles assessment. This assessment breaks people into one of four different communication styles. This assessment and debrief takes 45-60 minutes and can be done as a stand-alone workshop or in conjunction with a Venture Out course. Venture Out facilitators will incorporate language from True Colors into your Venture Out course debriefs. True Colors gives participants language to talk about their communication strengths and weaknesses. 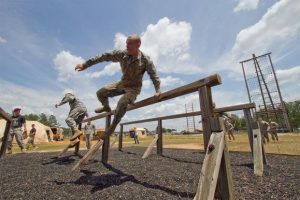 Channel your inner “American Ninja Warrior” as you race through our new Confidence Course, built by University of Missouri ROTC. Never rock climbed? Want to brush up on your rock climbing skills? Venture Out offers Rock Climbing 101, a three week course offered each September. Classes are open to students and community members over the age of 13. We will teach beginners the basics of rock climbing, while allowing veterans to hone their skills. Classes take place at the Venture Out complex and at Capen Park in Columbia, Missouri. Enrollment is limited. Click here for more information. Venture Out invites Summer Welcome participants to challenge themselves at Tiger Climb, a three hour open house style climbing event featuring our 60’ Alpine Tower. Tiger Climb is open to any interested incoming MU students participating in Summer Welcome. Students sign up through New Student Programs when they register for Summer Welcome. Tiger Climb will take place in the afternoon on select Thursdays in June. Students will need to arrange their own transportation to Venture Out. We recommend driving. See our Location Page for more. Participation in Tiger Climb is limited to students only. Parents and guests are welcome to watch under our pavilion but climbing is limited only to students. Space is limited and a $20 registration fee is required. Registration information is available on the Summer Welcome website and on the Summer Welcome Optional Activities page.